A chef's neckerchief offers a finishing touch to the culinary uniform. 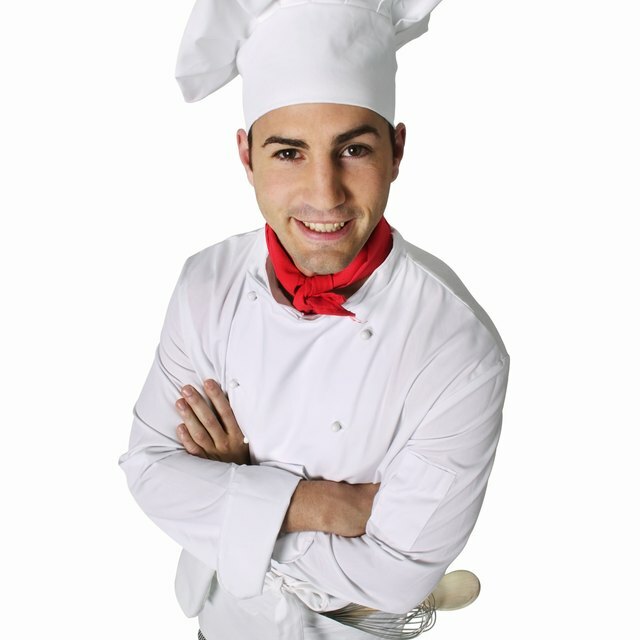 A culinary neckerchief, also called a cravat, adds an impressive finishing touch to a chef's uniform. While it used to serve the practical function of providing a way to catch and absorb sweat over open fires, its purpose today is more stylish. Compare the culinary neckerchief to a businessman's necktie. It adds a sense of professionalism. Tying the cravat is similar to tying a Windsor knot. It takes practice, and often patience, to achieve a crisp look, but the result is a professional, pulled-together look in the kitchen. Fold the neckerchief in half diagonally to form a large triangle. Press the triangle with a warm iron to get a crisp fold. Turn the neckerchief so that the point is closest to you. Fold the point up toward the long edge about 3 inches and flatten the fold. Take the folded edge in your hand and fold it over again about 3 inches. Continue folding in this manner until you are about 2 to 3 inches from the long edge of the neckerchief. Fold the long edge down to meet the top fold, and continue folding up as before. This ensures a neat finished edge on your cravat. Iron the folded neckerchief to obtain a clean, professional look. Place the neckerchief around your neck, arranging the midpoint at the center of the back of your neck. Pull the ends over your shoulders and adjust the ends as necessary so they are even. Cross the left end of the neckerchief over the right end, and bring the left end up and through the part that is around your neck. Cross the right end of the neckerchief over the left end, and pull the right end through to make a knot. Pull both ends to tighten the knot. Arrange the neckerchief by gently tugging the knot so that it is centered at the front of your neck. Tuck the ends inside the front of your chef's coat to finish the look. Iron each fold as you work for a flat, crisp finish. The Culinary Institute of America notes that the colors of neckerchiefs notate different positions at the Institute. Instructors wear white and students wear yellow, except for Service Club members, who wear blue.